We’d love your help. Let us know what’s wrong with this preview of The Emerging Church by Dan Kimball. To ask other readers questions about The Emerging Church, please sign up. in my opinion, this is the best book to read as an introduction to the idea of the emerging church. it lays out the ideas of the post-modern, post-christian culture that the church of the modern era is failing to reach and gives a lot of practical ideas of how to make the emerging church happen. a must-read for any christian who wants to see their faith remain viable for younger generations. This book is written to those in seeker-sensitive churches who have found that the younger generation is not finding their services attractive. His case is built on personal experience of what the postmodern generation is looking for. Some of what he says he feels a little over-trendy (regardless of his protestations to the contrary). However, he does have put forward some very good insights in this book. The book is limited to American culture, focusing particularly on the state of things in the more liberal West Coast. I think that Kimball makes several valid points in this section. First, he notes that postmoderns do not come into church with a Judeo-Christian worldview that everyone in previous generations was expected to have. Instead of being people who would welcome Christianity if they could just be shown how it fits into their life, they are actively anti-Christian because of our perceived abuses of power. Second, Kimball notes that postmoderns are into spirituality, not presentations. His point here is that slick powerpoint presentations and well-produced music and drama do not make a worship service that appeals to postmoderns. They appreciate community, authenticity, and “spirituality”. Third, postmoderns live in a pluralistic religious society. They are much more aware of Buddhism, Islam, Wicca, and New Age than their predecessors. As such, they are also much more wary of Christianity's claims to uniqueness. Fourth, postmoderns are not just going to “Grow up” and come back to church like their parents did. This is more than a generation gap, it is a world view change. He has LOTS of modern versus postmodern comparison charts. The gist is that moderns are rational, systematic, propositional, fixed, and individualistic. Postmoderns tend to be experiential, fluid, mystical, narratival, and communal. FACT: The unchurched population of America is the 5th largest mission field on earth. Postmoderns tend to be less deterministic about religion, sexual orientation. Kimball also marks the trend towards a global culture. (I would add, a global culture dominated by consumerism. How does THAT fit in with postmodernism?) Most postmoderns are mistrustful of Christians while respecting Jesus Christ. They are especially leery of the creepy, consumeristic Christian subculture that we have created. Kimball is all about being the church instead of going to church. He believes that postmoderns respond much more to interaction and the responsibility that comes to them in a kingdom theology. Absolutely against the idea of consumer Christianity (passive entertainment Christianity). Very engaging and thought provoking. It's interesting to hear what Dan has to say about the culture and what people think about "church." Of all the books I've read about how "church" is organized in America, this book is probably the most surprising and exciting. Kimball's book was not only captivating in content but also in the layout of his material. This was in itself a postmodern approach to written text with multiple suggestions, comments, dialogue and monologue on each page. Divided into two parts Kimball explores deconstructing and reconstructing ministry. The story of his friend `Sky' and how he became a Christian set the pace for part one. Challenging the focus of worship and examining how we arrived here today by quoting the men of Issachar pro Kimball's book was not only captivating in content but also in the layout of his material. This was in itself a postmodern approach to written text with multiple suggestions, comments, dialogue and monologue on each page. Divided into two parts Kimball explores deconstructing and reconstructing ministry. The story of his friend `Sky' and how he became a Christian set the pace for part one. Challenging the focus of worship and examining how we arrived here today by quoting the men of Issachar provokes expansive thought. Thos men `knew' the times they were living in. Multisensory approach to ministry that includes music, images, communion, incense and personal contribution appreciated the postmodern culture that needs to experience God. This was recognized by accepting people return to their roots at some point. But what if those roots were not Judeo-Christianity? Part two begins with defining the approaches of the seek-sensitive with a post-seeker-sensitive with four practical ideas for engaging the latter. What Kimball calls `Vintage Christianity' is more organic is approach in gather as a church than a linear approach of the modern culture. This is also reflected in the style of leadership by quoting Grenz from Primer on Postmodernism. He compares the leadership of Captain James T. Kirk as a CEO modern leader to Captain Jean Luc Picard as an emerging leader. How leaders lead will determine the type of disciples they make. I found myself in complete agreement with shifting values in preaching, evangelism and discipleship. While the message of the Bible is unchanged the method of communicating it and growing in it were a welcome challenge. Kimball places the emphasis on changing `values' without changing scripture itself. Relationship and trust are essential to a process instead of an event with a concluding invitation. This not only engages people to be missional as a church but it also cuts the cost of annual budgets in half. Kimball restates throughout his book that the core of shifting values is centered on the mission of the church to make disciples. It is not the Roman method of presentation, decision and fellowship but the Celtic method of fellowship, ministry and belief. I disagree with a polarized view of the church Kimball seems to have. He welcomes pull points from colleagues who seem to grasp a both modern and postmodern. It could be seen as a fashion, trend or fad church. Although he acknowledges a postmodern culture will engage in intelligent theology, very little of this is seen in how he describes their gatherings. Although multisensory ministry is vital in communicating to a postmodern culture, I would want to see a clear explanation of scripture rather than a study of other religions. (1 John 1:1) Although Kimball quotes it I cannot fully see it in practice. Kimball's work is relevant both in content and layout in understand culture. As a whole The Emerging Church keeps the focus on the church and what happens as Christians gather together. The material is a powerful tool for anyone in church leadership or approaching a church / service plant. Kimball examines the `experience' of church as his focal point throughout. He avoids the trap of criticizing other churches several ways. He demonstrates a perspective from other colleagues in pull points. He tells frequent stories of visiting other churches to learn. Overall Kimball's book was a practical exercise in being relevant to the postmodern culture. The one thing Kimball does effectively is to blast the shaky foundations of the seeker-sensitive movement; however, the careful reader will note that he does not escape from this morass in practice, as witnessed by the many points at which he seems more concerned by what outsiders/non-Christians would think of the church than he seems concerned with their Christian counterparts. Take for example his reference in Chapter 16 to his "haircut homiletics" sessions with his unsaved hairdresser, during The one thing Kimball does effectively is to blast the shaky foundations of the seeker-sensitive movement; however, the careful reader will note that he does not escape from this morass in practice, as witnessed by the many points at which he seems more concerned by what outsiders/non-Christians would think of the church than he seems concerned with their Christian counterparts. Take for example his reference in Chapter 16 to his "haircut homiletics" sessions with his unsaved hairdresser, during which he's supposedly learned more about preaching than in any seminary class. Unfortunately, after who knows how many years of his using her to keep his finger on the pulse of the lost generations, a Christian friend of his almost ruined the entire set-up by mentioning becoming "saved" in front of her! Oh NO! Now she was actually in danger of being confronted with the Gospel, something that Kimball had been carefully shielding the poor little postmodern hairdresser from for who knows how long. If he had his way, it would be much better to take years of giving her dating advice before working around to faith, since that's what postmodernity demands. Now don't get me wrong, I'm all for building relationships and rapport with people: after all, I have conversations with my own hairdresser that have led to spiritual things. Sensitivity, care, and love are needed, but not to the extreme that causes us to avoid sharing the Gospel. Apart from occasional Scripture references sprinkled sparsely throughout in a sort of proof-texting way (many of them used out of their context, I might add), Kimball offers very little Bilical foundation. In fact, for someone who claims to be a "Bible junkie," he spends much more time quoting Madonna, U2, Gandalf, and Deepak Chopra than he does the Scriptures. There are even points at which he speaks in favor of ignoring theological conviction in order to pursue what he thinks is the best thing to do in response to post-modernity (see p. 150 and 163 for examples). Coupled with his heavy, underlying use of negatively connotative words to describe senior pastors or anyone in leadership outside of the Emergent Movement, the above issues were enough not only to set my teeth on edge from early on, but also led me to read with a critical eye and a healthy dose of skepticism. A reader who approaches this book with a similar grasp of Biblical teaching, historical context, and desire to evaluate the overall message critically will likewise experience a similar reaction. This is quite a challenging book for any traditional pastor. In fact, I think the material presented within would be quite challenging even for pastors of more modern churches. But challenging in a good way. I would encourage every pastor to read this and work through the material within, but maybe read a book like Stott's Cross of Christ or Noel Due's Created for Worship first to get your priorities straight. The need for having a firm Biblical foundation before reading this book is great becaus This is quite a challenging book for any traditional pastor. In fact, I think the material presented within would be quite challenging even for pastors of more modern churches. But challenging in a good way. I would encourage every pastor to read this and work through the material within, but maybe read a book like Stott's Cross of Christ or Noel Due's Created for Worship first to get your priorities straight. The need for having a firm Biblical foundation before reading this book is great because though the ideas and concepts are quite engaging and exciting, some of them can be easily carried out in excess and without the proper motivation, setting, and emphasis. Kimball also has a habit of generalizing and stereotyping which sound convincing but aren't necessarily true. In addition to that, his criticism of the Seeker movement is rather passionate, but in the end his model is very similar, for it is also focused (on one level) at attracting people to church, though since this attraction is played out in a postmodern setting it looks, feels and behaves quite differently than the modern Seeker movement. What I think is good about this book (as I thought the same about his corresponding Emerging Worship) is that Kimball raises issues and difficulties facing the church at present. These issues must be dealt with, but not necessarily the way Kimball demands they be. The primary problem with his solutions is that not every church is in California, and nor are all the high school and college age church members completely up to their heads in postmodern thought. Pastors and ministry leaders should read this book not because it has all the answers, but they need to see if the issues are relevant to their body of believers as well as if any of the solutions proffered by Kimbal might be able to minister to their people in their respective settings. This is a mildly dated and basic but helpful book to introduce the emerging church to those who are otherwise unfamiliar with it. The writing style is definitely modern, with organized chapters, charts, and an "us-them" tone, which makes sense, as Kimball is trying to reach those who are not yet aware of the philosophical changes in the (mostly) younger generations who are not coming to their churches. I have read a fair amount about the emerging church, and so far, the content here is consisten This is a mildly dated and basic but helpful book to introduce the emerging church to those who are otherwise unfamiliar with it. 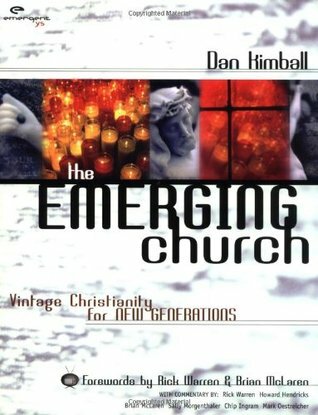 The writing style is definitely modern, with organized chapters, charts, and an "us-them" tone, which makes sense, as Kimball is trying to reach those who are not yet aware of the philosophical changes in the (mostly) younger generations who are not coming to their churches. I have read a fair amount about the emerging church, and so far, the content here is consistent with other authors, and it is probably more accessible than many other books out there. It also has helpful information that I hadn't considered (for example, postmoderns aren't going to one day just "grow up" and be modern like the rest of us - I was challenged by this concept into questioning my own assumptions and my too-frequently dissmissive attitude toward postmoderns as simply immature). Kimball tries really hard with this book. From the "post modern" layout to the writing style, this book is supposedly a definitive apologetic for the "Emergent" movement. The harder the author tries to explain and explore the concept, the more traditional religious boxes he puts things into, until those readers (like myself) who are involved in what has been labeled the emergent movement do not recognize it, nor want to be associated with what is doomed to be another church program. Kimball antic Kimball tries really hard with this book. From the "post modern" layout to the writing style, this book is supposedly a definitive apologetic for the "Emergent" movement. Kimball anticipates this, and really makes a sincere effort... explaining that these ideas are not a template to follow for programing, but a way of life. Although it seems to be very beneficial for those unfamiliar with the "Emergent" movement, the heart of the story gets lost in the fancy packaging. Divided into two sections, the first section does well at setting the scene for the emerging church and explaining the difference in philosophy and culture between the modern and post-modern generations. The second section talks about the practicalities of doing church in a post-modern world and this is where time has taken its toll. I can see how this would have been radical stuff eight years ago but nowadays most of his suggestions are common place. Perhaps the church has truly emerged after a Divided into two sections, the first section does well at setting the scene for the emerging church and explaining the difference in philosophy and culture between the modern and post-modern generations. The second section talks about the practicalities of doing church in a post-modern world and this is where time has taken its toll. I can see how this would have been radical stuff eight years ago but nowadays most of his suggestions are common place. Perhaps the church has truly emerged after all? Wonderful introduction to help Christians understand those who are interested in spiritual things but not how many Christians practice it. He balances critiquing and praising the past well. He stays in the personal realm - shying away from theorizing what people "might" want. Be warned, though, you may see yourself in his descriptions and want more change than others are interested in. This review has been hidden because it contains spoilers. To view it, click here. Terrific book! "Emerging church 101" for those who don't know what it is or why it's important. Kimball is the best and making the complex topic of postmodern ministry clear and simple. It's full of quotes and comments in the margins by other voices in the e-church movement. While I didn't always come to the same conclusions as Kimball, I LOVED his approach to uncovering the ancient and holy ways to approach God in our hi-tech, low-relationship world today. Check it out and wrestle with his views... it's good for you. Attempts to describe post-modernism. Explains how we can embrace people in their culture rather than conforming people to our own culture, without compromising the message of the gospel. A very lucid, well-written argument for why and how American Christian churches need to rethink evangelism. This book is really good. It really made me think. Good book, but as with any book dealing with church practice and/or doctrine, be sure to read it with your open Bible in your other hand. Picked this up at a garage sale for 50 cents. So far it's interesting. Good handbook for those who need to understand the postmodern Christian and what he or she is searching for. I love it when a book gets me thinking about applications for my ministry. This book does that. I have recommended it for congregational leaders. Another good read to challenge your thinking on what worship is. Does it have to be on Sunday morning at 10:45 or can friends gather on Thursday after work? This was the book to read when being "emerging" or "emergent" was cool. Dan is cool and makes a lot of sense. I am afraid that others have come along and ruined what he and a few others started. This book was like a simple review of a class I took in college.. I enjoyed it but didn't always agree with the stereotyped it gave for the modern and post-modern generations. Dan was born and raised in north eastern New Jersey, and got his BS in Landscape Architecture from Colorado State University. Dan was a drummer in a rockabilly/punk band for many years and lived in London, England for a year playing in the band. After the band ended, Dan went to Israel and lived there for several months studying the Bible on his own to see whether Christianity was a valid faith, o Dan was born and raised in north eastern New Jersey, and got his BS in Landscape Architecture from Colorado State University. Dan was a drummer in a rockabilly/punk band for many years and lived in London, England for a year playing in the band. After the band ended, Dan went to Israel and lived there for several months studying the Bible on his own to see whether Christianity was a valid faith, or simply the religion of American suburbia. Mainly all of his closest friends were not Christians, so he desired to be able to intelligently explain and know why Christianity was a faith which made sense. After Israel, he moved to Santa Cruz where he began attending Santa Cruz Bible Church and got very involved in various ministries at the church. Because he felt he wanted to dedicate all his time to serving in the church, he went to Multnomah Biblical Seminary in Portland, Oregon and graduated with a Graduate Certificate in Bible. Upon returning to Santa Cruz after graduating from Multnomah Seminary, he became high school pastor at Santa Cruz Bible Church working with teenagers in what became a large youth ministry along with Josh Fox. After serving in high school ministry for 8 years as high school pastor, Dan (and Josh) felt the need for a worship gathering and ministry that reflected more of the values of the emerging culture and heart of emerging generations. So, they started the Sunday night "Graceland" worship services and ministry at Santa Cruz Bible Church. Graceland initially started as a college ministry, but because it connected with a broader age range became a "young adult" ministry and then eventually became alternative worship gatherings for all ages. After several years, Graceland eventually folded into Santa Cruz Bible Church, as the dream for launching a new church in Santa Cruz was formed. Dan was part of the leadership team that launched the first church plant of Santa Cruz Bible Church when Vintage Faith Church was birthed in February 2004. Dan's current role with Vintage Faith Church is primary teaching pastor and oversight of the missional aspects of the church. Dan has been married to Becky since 1990 and have two daughters, Katie and Claire and one day hope to have a poodle. Dan loves rockabilly and punk music, comic art and drives a 1966 Mustang that is slowly rusting. Dan is currently pursuing a doctorate degree (Doctor of Ministry) from George Fox Evangelical Seminary where he also serves as adjunct faculty mentor.